During hot and humid Georgia summers, everyone loves to get into your family pool, including the pooch. But is it a good idea to include your dog in the family fun? When you’ve been in the pool installation and maintenance business for as long as we have, you hear a lot of opinions on the subject. We think you are smart enough to make the right choice for your family, your dog, and your pool. 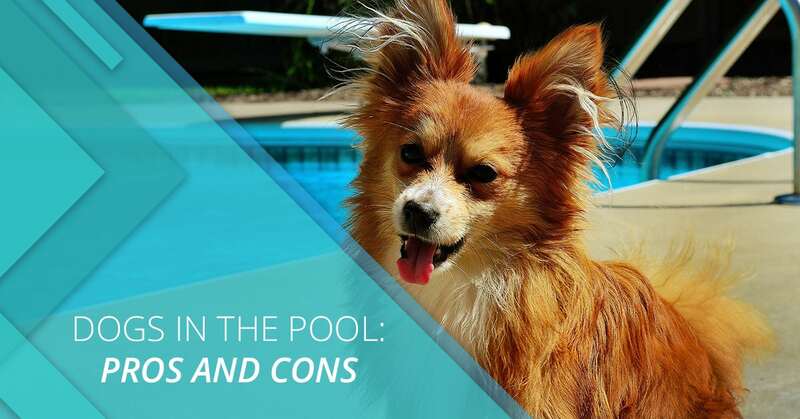 Here are some pros and cons that you might want to consider if you’re still on the fence about dogs in the pool. If you do decide to let your dog swim in the pool, you’ll be responsible for keeping them safe. Not all dogs naturally know how to swim. And, even those that do may not be very good at it. Your dog looks to you for safety and security, so take the time to make sure they are good swimmers before letting them in the pool. Nova Scotia Retrievers, Golden Retrievers, Labrador Retrievers, Newfoundlands, and any dog breeds with “water dog” in their name, usually love the water and are pretty good swimmers. And, it may not come as a huge shock that Pugs, Bulldogs, Basset Hounds and Doberman Pinschers are known more as sinkers than floaters. Just like kids, dogs should not swim unsupervised. If you don’t have a fence to keep your dog away from the pool when they are home alone, teach them that they are only allowed in the pool by invitation. This isn’t a difficult thing to teach a dog. But, like anything else, it requires consistency on your part. If you’ve trained your dog that they are only allowed on the sofa or the bed if they are invited, you can train them the same way when it comes to the pool. Dogs with long hair can get weighed down. Your little fluff ball may love jumping in the pool. But remember, there is a very little body under all that fur, and as they become saturated, they may have trouble staying afloat. Dogs get ear infections. If your dog is prone to ear infections, talk to your veterinarian about how to make sure that pool water doesn’t exacerbate the problem. Dogs drink pool water. A little bit of pool water isn’t likely to hurt your pooch. But it is important to make sure they know that the pool is not a primary source of water for them. Just like teaching them to only enter the pool when they have an invitation, they should be trained to drink from their bowl when they are thirsty. If none of the above issues give you and pause about letting your pooch into the pool, that’s great. But there’s more to consider, including what your dog can do to your pool. Ponder these impacts. Dogs are very furry. If you’ve hired North Georgia Pools or someone else to maintain your pool, be sure to let them know if fido is a frequent swimmer. You’ll want to make sure extra attention is paid to filters and any places where dog fur can clog up the works. We’ve heard some people say that having a dog in the pool is like having 50 people in the pool. We don’t know if that’s true, but after cleaning out a lot of fur-filled filters, it sounds pretty close to us. Dogs have sharp nails and teeth. Even the best behaved dog will use their claws and teeth in ways that feel natural to them. They may not be acting aggressively or doing anything out of the ordinary, but they can still damage your pool. Given the quality materials that pools are made from today, the chances that your dog is going to do any serious damage are pretty low. But, do you really want to take that chance? Well, what do you think now? Will your dog be welcome in the pool? Either way, be sure to give North Georgia Pools a call if you need help with pool maintenance or if you need some repairs done. And if you are in the market for a new pool, especially a new vinyl-lined pool, you’re in luck. That’s our specialty. We hope to hear from you soon. Happy swimming!